Luduo, a village 5,000 meters above sea level in the city of Lijiang, Yunnan Province, used to be a leper colony, but was largely abandoned when residents moved to a new, less high-up village last year in search of milder living conditions. 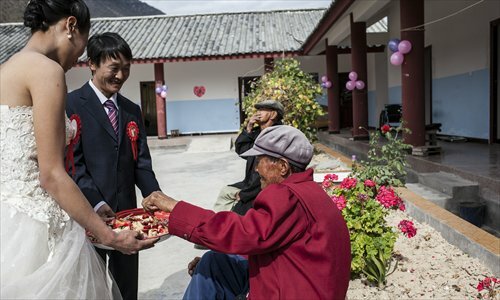 Earlier this month, the abandoned village witnessed a wedding, the first, and probably the last, in the village's six decades of existence. 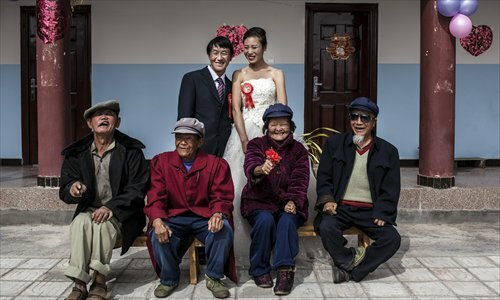 The happy couple were Li Kaiyuan, 34, who was born and raised in Luduo, and Lu Chunxiu, from another village in Lijiang. Both of their mothers were lepers, and they had worried about the chances of their children ever getting married, due to the discrimination faced by people who grow up in leper colonies. Even though Li and Lu are perfectly healthy, and all of the villagers have been successfully treated and are no longer infectious, most locals prefer to keep their distance. This led to the desperate Lu having to marry her cousin, but she soon left to escape the abuse he inflicted upon her. The newlyweds were introduced to each other by volunteers of a charity group who came to Yunnan to help support people that have recovered from leprosy. The village of Luduo was established in the 1950s among Yunnan's snowy mountains to quarantine lepers. At its peak, it had more than 120 residents. As the residents gradually returned to health, many of them left and tried to conceal their connection with the colony. Last year the remaining villagers moved down to a new courtyard-like residence provided for the seven remaining residents, most of whom are elderly. After the wedding, the couple returned to their home in another county, where they have a farm. They plan to build a new house and have children who may be able to live a life free of the discrimination they faced.